Stonecrop nurseries is nestled in the heart of the "Isle of Axholme" near the small market town of Epworth the home of the Wesleys. 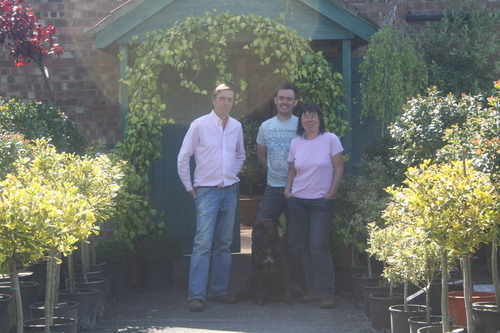 We are a Gold medal winning nursery, established 25 years ago, originally founded by Barbara and Robin, their son Robin has since joined the business and has helped to build on their success.
" We always try to provide a quality product with good old fashioned customer service." We attend a large number of events each year and over the last 20 years our reputation has gone from strength to strength. We have received numerous medals and awards for our plants and displays including RHS Gold and Silver gilt medals, see our calendar of events to see where we are attending next. We specialise in Herbs, Olives, Bay and other hardy mediterranean plants and trees, so if you have any special requirements then chances are we can help to source something to suite your needs. Christmas is also a very busy time for us, we make traditional holly wreaths , blue spruce wreaths and a wide range of planted containers and baskets. We are very happy to welcome visitors to the nursery, but a phone call is advisable.